SEJONG - In large discount chains nationwide, it has become easy to find consumers putting beer products into their carts with such brands as Hangang, Gangseo, Dalseo and Jeolla. The names of Hangang (Han River) and Gangseo (a district in Seoul) originate from beer producer Sevenbrau’s headquarters, which is located at the Gangseo Hangang Xi Tower in Gayang-dong, Seoul. Dalseo is a district in Daegu, and Jeolla refers to the two provinces in the southwest of the country. Shoppers could buy four 330-milliter bottles, regardless of the brand, for 10,000 won ($8.85) at discount chains. The products hold price competitiveness compared to ales from countries such as the US, Japan and Europe. Price tags of some import ales hover around 6,000 won to 8,000 per bottle. Meanwhile, some salaried workers are attracted to Gwanghwamun (named for a large square in downtown Seoul), Jeju Baengnokdam (a lake at the peak of Hallasan) and Jeju Wit at convenience stores. 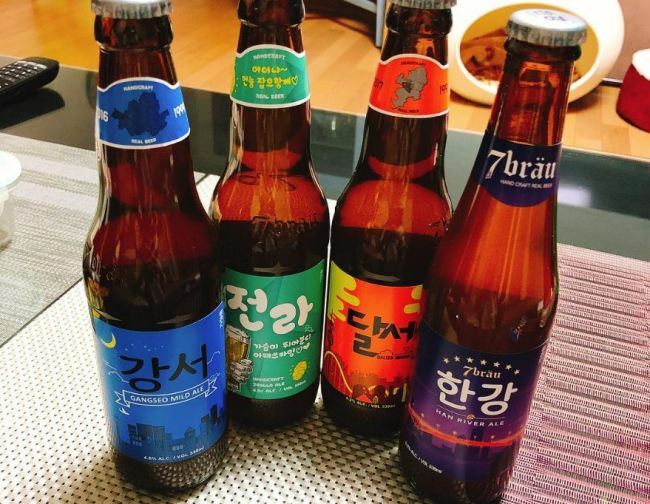 Many convenience stores in major cities offer the sale price of 10,000 won for three 500-milliliter cans of three brands made by the regional craft beer producers in Eumseong, North Chungcheong Province (for Gwanghwamun), and Hallim, Jeju Island (for Baengnokdam and Wit). Though consumers could easily buy four import lager cans at convenience stores for 10,000 won, three ale cans for the same price is a first in the nation. Likewise, local producers are engaging in active promotions to closely compete with import brands as the market share of ale products has continued to grow in the past few years. Among other brands are Seoul, Seocho, Sokcho, Seol, Dongmyeonghang and Daepohang. While lager offers refreshment as a beer type from bottom-fermenting yeast that also ferments at relatively cold temperatures, ale is brewed on the basis of a warm fermentation method that generally provides a thick, full-bodied taste. Further, local craft brewers are pinning hopes on the coming revision of the taxation base for local and import beer products. Should the Ministry of Economy and Finance really move to levy taxes based not on alcohol content but on product volume, consumers may enjoy the ale at lower prices, like the four-can deal at 10,000 won among import lagers. Meanwhile, some import brands have recently engaged in the cutthroat price competition initiated by local brands. The Jochiwon branch of discount chain Homeplus, located in Sejong City, has offered three 355-ml bottles for Twisted Manzanita ale from San Diego, California, at 10,000 won as a sales promotion. An employee of the liquor industry in Gyeonggi Province cited quality involving taste for the main factor for the coming market share. “Just for the US, we can see dozens of ale brands from the country at discount chains. I don’t think the taste of Korean products is equivalent to that of import counterparts,” he said. He also pointed out that local brands usually resort to imported ingredients to a certain portion, though they brew the ale here. Nonetheless, some industry insiders tout the growth potential of local ales in the coming years. 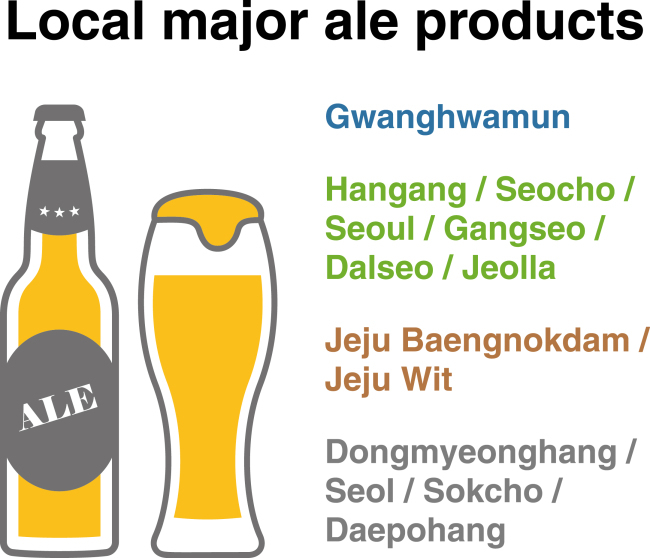 A retail industry worker cited data that showed that Gwanghwamun ale topped a list in collective lager and ale sales for 500-ml cans at a convenience store around Jonggak Station in Seoul. In the sales for October 2018, Ganghwamun beat Cass, a local lager brand, at GS25, according to the data.